We grew a couple types of beans this year. Kentucky Wonder and Rattlesnake. The taste of Kentucky Wonder is great, but the beans match the color of the leaves and we miss some when picking. The Rattlesnake beans are purple striped on a green background. 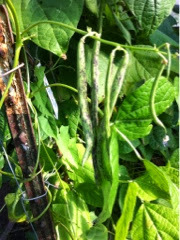 The beans grow in clumps on these huge vining plants. As the season progresses, we need the tall ladder to pick beans! Many reports on the nutritional value, the protein and many vitamins. We eat them year round in many ways and love them.